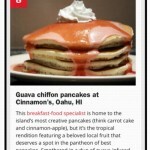 Cinnamon's Restaurant » Guava Chiffon – One of the Top 10 Pancakes In America! 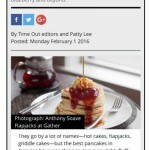 Guava Chiffon – One of the Top 10 Pancakes In America! Time Out is a world-renown, heavy-hitter that knows it’s stuff. Cinnamon’s is proud to represent & showcase the common Guava in all it’s tart, tangy, island-sweet glory! Visit Cinnamon’s at the ‘Ilikai Waikiki or Cinnamon’s Kailua to taste for yourself! !